We are a fortunate city when it comes to nature’s most valuable resource: water. Former leaders laid the provisions for our present generation to have an abundant supply of water. The current leadership is doing just the same to secure a quality water supply for many years to come. 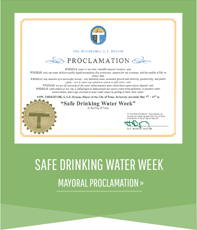 Tulsa’s vast raw supply benefits several surrounding communities by providing water from Tulsa’s resources.